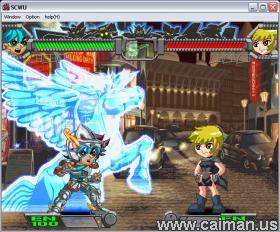 Caiman free games: SCWU by Suneo - Team FK. 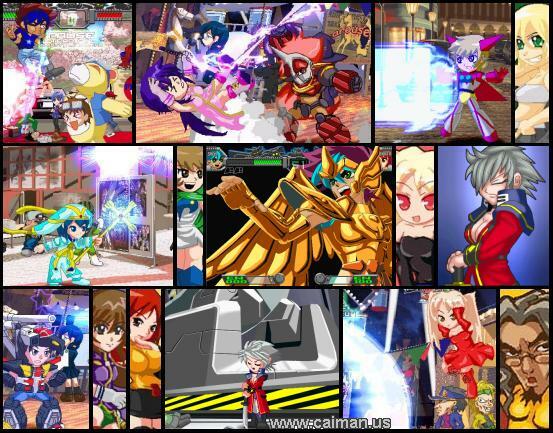 In this Japaneese 1 or 2 player fighting game called Super Cosplay War Ultra (SCWU) the fighters turn into different characters from anime movies, TV shows and video games with each attack. There are 33 characters plus some hidden ones and 16 senarios (backdrops). What sets this game above and beyond other fighting games is the graphics. This is why the download is so huge (240 MB). Practically everything in this game is animated, including the backgrounds! There is music, voice and sound effects also. If your are good enough to beat the games' final boss without losing a single round then you can unlock secret characters. The contols listed below are ONLY correct if you download the .ini file from caiman and replace the original one in the game's directory with this one. No matter how you do it, all the contols and joystick buttons are definable to your liking in the game. 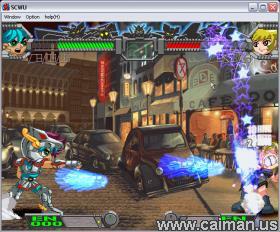 SCWU is without a doubt the best freeware fighting game available. If you have anything other than a dialup connection and like fighting games, it is well worth the 240 MB download. However if you haven't played fighting games before, I would not recommend this game because the documentation is in Japaneese. Direct DOWNLOAD from authors site (EXE - install) 243 MB. Authors downloadpage (Chinese + a bit english) .